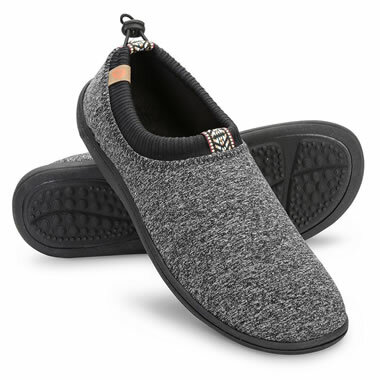 These are the indoor/outdoor slippers that repel water with an innovative exterior while warming the feet with a terry interior. The heather knit uppers are treated with smartDRI technology against which water cannot gain purchase. The cotton rib cuffs provide comfort in concert with the elastic drawcord and adjustable toggle. The cotton terry lining provides warmth and wicks away moisture to keep feet dry and the durable outsole ensures a confident grip. Women’s S (5-6), M (6 1/2-7 1/2), L (8-9), and XL (9 1/2-10 1/2). The Waterproof Indoor/Outdoor Slippers (Women's) comes with The Hammacher Schlemmer Lifetime Guarantee. Items that we sell are guaranteed for their normal life under standard non-commercial use.